The music for the Harry Potter films has been an interesting course. John Williams's effort on the first three films has proven to be the best entries in soundtrack series. Patrick Doyle surprisingly did a great job taking up the reins. 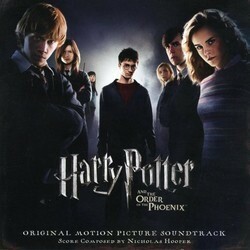 For Order of The Phoenix (most likely to correspond to the change in directors) Nicholas Hooper was invited to score. Like Doyle's previous effort, Nicholas Hooper doesn't stick to the 'Hedwig's Theme' formula. The theme mostly is hinted at in it's full form. The biggest issue with Order of the Phoenix is it's lack of subtlety. Hooper takes the words 'magical' to the extreme and infuses alot of 'sparkling' into the score. The rest of the underscore is completely bland as well, at times feeling like it could have fit a completely different genre, not one of magical wizards. For the newer themes, they are ok. A fast paced irish jig is present in 'Fireworks' and Umbridge's theme is actually alot of fun. For Dumbledore's Army, Hooper uses (in my opinion) a gratingly annoying melody that sounds far too 'cutesy'. The action music isn't bad at all, surprisingly. Other than that, there really isn't too much to say. Maybe I am just being far too harsh on Nicholas Hooper, but Order of the Phoenix really is the weakest score in the series. Some of the newer themes are fun, but they get so little use. Not to say Hooper is a bad composer, but this is definitely (and sadly) the blandest of the Potter scores.